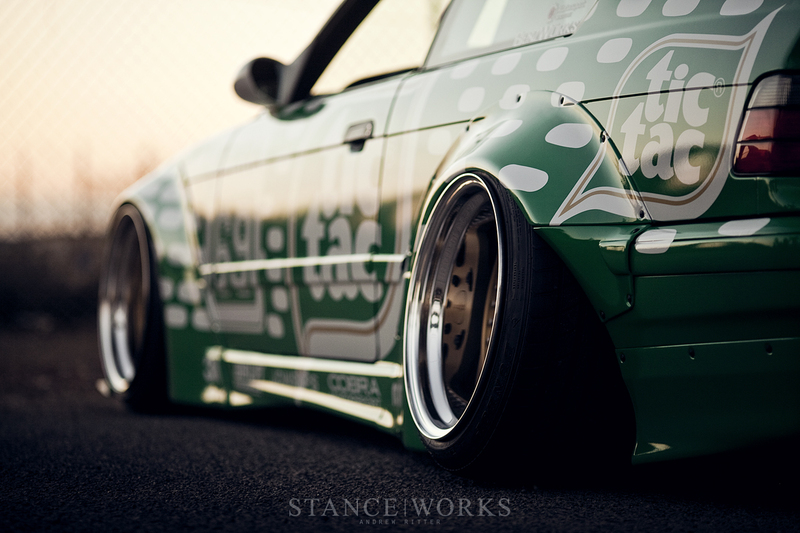 Earlier this year, Rotiform's Brian Henderson and Carl Taylor arrived at Worthersee in a pair of Rocket Bunny-kitted E36 "Art Cars," stealing the show with their loud but historic color schemes, aggressive nature, and flamboyant style. In the wake of success, Carl Taylor has done it again, this time harking to one of DTM's best liveries: the Valier Team Tic Tac E30 M3. Each year, the automotive industry stands on end in preparation for SEMA, one of the automotive world's largest trade shows. With hundreds upon hundreds of cars on display, both inside and out of the Las Vegas Convention Center, everyone does their part to stand out amongst the pack. Builds range from atrocities that seem better suited to "Worst of Show, NOPI 2001," to some of the year's biggest and best; cars that exude taste and style while defining craftsmanship. Carl Taylor's answer to the big question wasn't far off the mark from SEMAs 2014's common denominator of rivet-on fender flares; however, he managed to capture attention above many others. 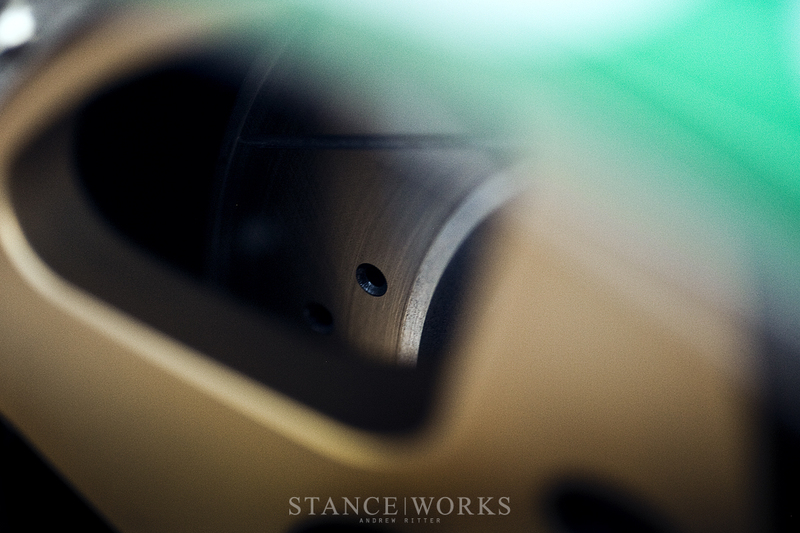 "That was my favorite car at SEMA." We've heard it more than once in reference to Carl's latest creation, but what makes his 20-year-old BMW coupe stand out against the crowd? Any booth that bared even minimal relation to our niche of the automotive world seemed to display a car with a body kit sourced from Rocket Bunny, Trakyoto, or Liberty Walk; all similar in style and designed by the same group. From Lamborghinis, Ferraris, and the new BMW M4, to S13s, RX7s, and E36s, countless cars have fallen into the same expected list of parts that have been defined as 2014's "must haves." 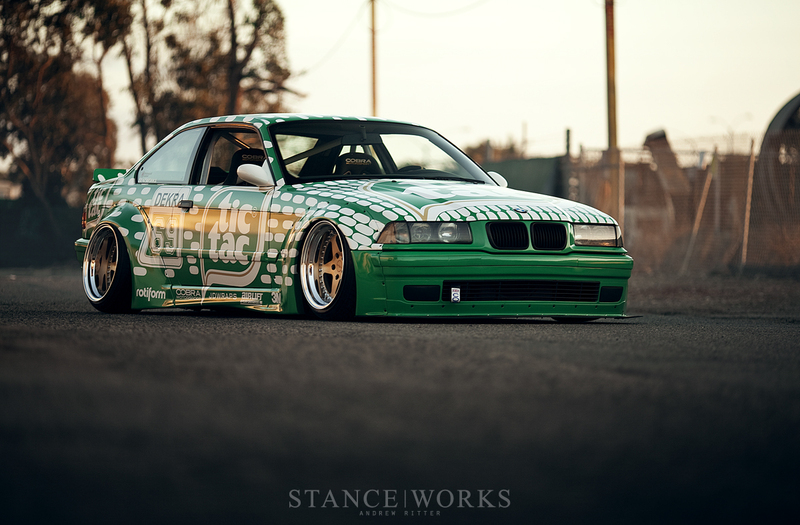 Carl's E36, on the other hand, bears one strikingly obvious difference: in lieu of vibrant paint or technicolor vinyl, Carl has rolled the clock back to 1992. The Tic Tac scheme, while striking and bright, is rich with history and heritage, and a bit of humor. 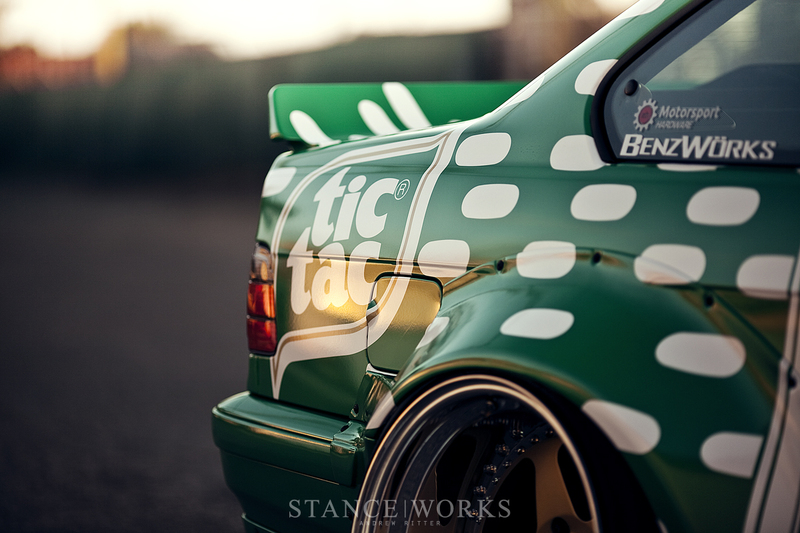 Tic Tac, after all, isn't necessarily a brand name indicative of motorsport greatness. 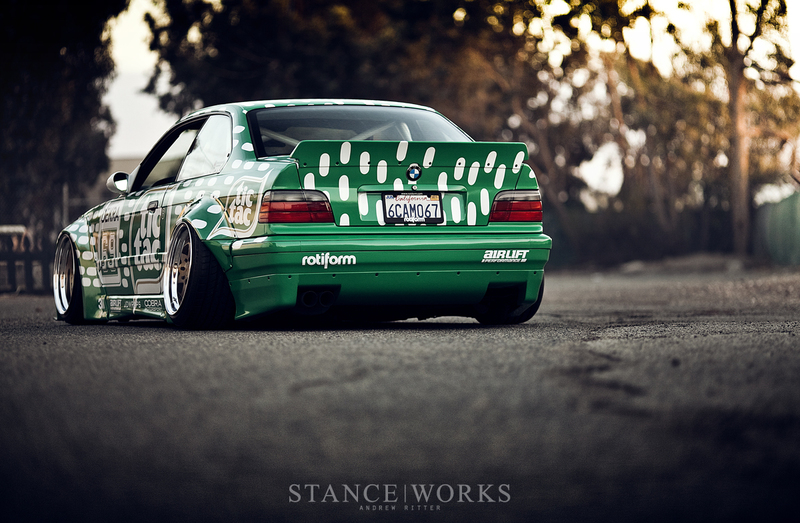 Hidden beneath the livery, a Rocket Bunny kit flows from front to rear, over and around the fenders, giving the slim-waisted E36 some much-needed hips. Having sourced a relatively nice E36 M3 as a starting platform, Carl felt only minor remorse for cutting the front and rear fenders to bits to allow fitting of the fiberglass arches. While even Carl agrees that the kit isn't his favorite, the lines are heavily helped by the patterns of the vinyl. A non-M front and rear bumper were swapped to work with the kit, which while unexpected, offers a nice change to the expected. 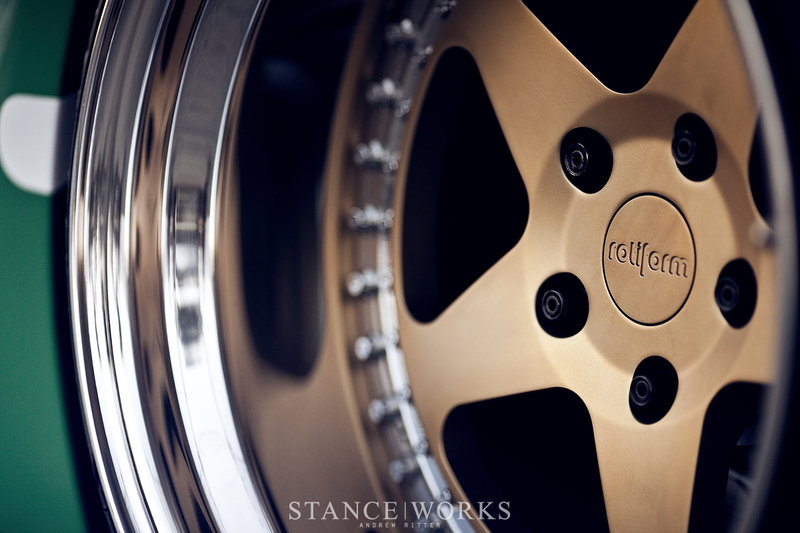 To fill the arches, Carl went with Rotiform's ROC, one of the earlier designs, yet tried and true as a classically styled 5-spoke wheel. With offsets in the rear hovering somewhere around -80, the polished lips offer up some of the car's only shiny surfaces, and draw attention to the satin gold finish of the centers. 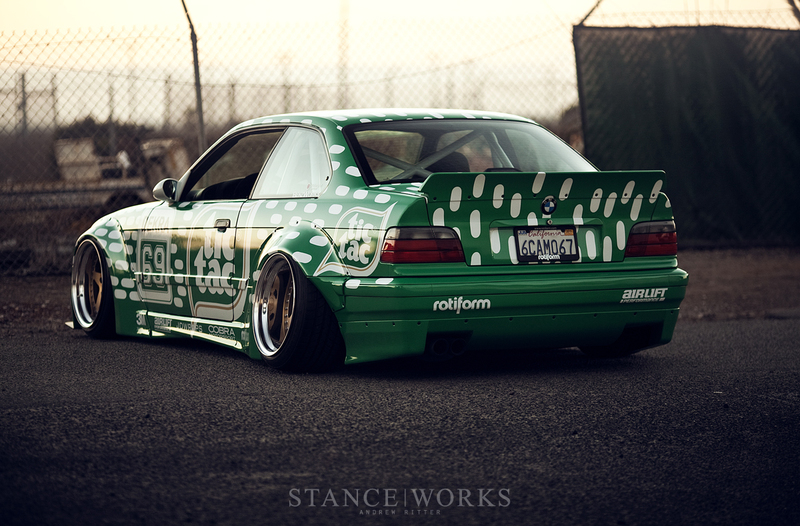 Another major partner in the car's build is Air Lift. 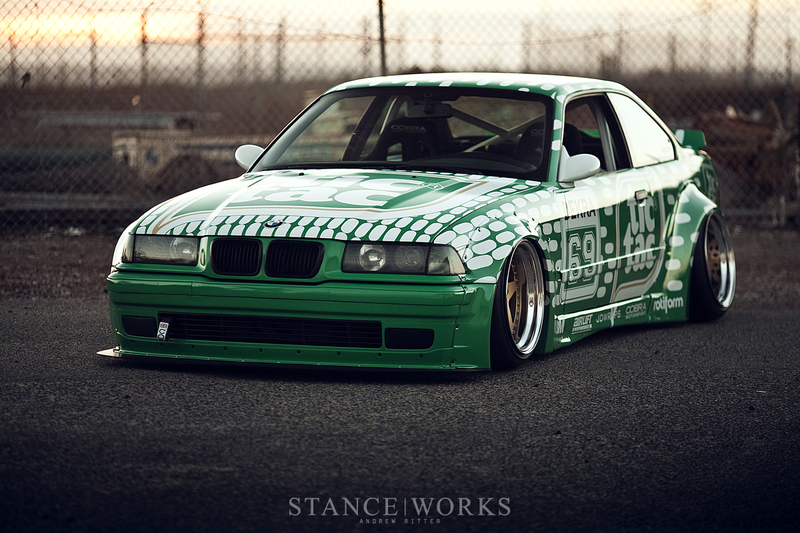 Using their bolt-on E36 kit, the Tic Tac E36 clacks against the pavement as the air is expelled from the bags, and the fiberglass arches flex subtly against the wheels as the suspension settles. If there's any fear that the car isn't driven low, rest assured that Carl left the parking lot with the sound of metal clinking and plastic flexing against the asphalt. Inside the car, the air system continues, with a polished tank and two Viair compressors taking the place of the original rear seat. Above them, a white half-cage fills the back half of the coupe, and plays well off of the motorsport-inspired exterior. 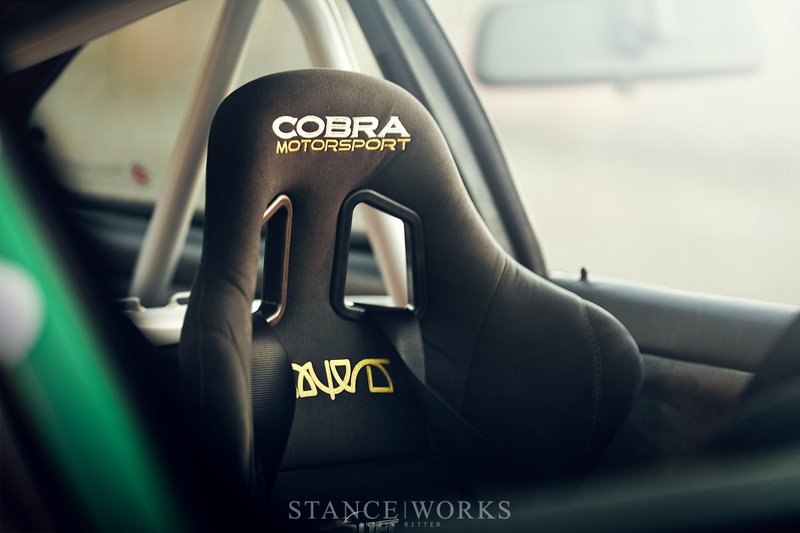 Cobra seats provide a substantial improvement over the factory Vader seats, often a love-it-or-hate-it option. Other tidbits, such as a wheel and a secondary hydraulic e-brake round out the driver's utilities. As a SEMA build, its parts do, in a sense, seem a bit formulaic, but it's the simple touches and ideas, which Carl has become known for, that have helped this mid-90s coupe stand out against $100,000 cars. It's not complete yet, he says, but what's to come is sure to leave us impressed as always. However, most peculiar about the car is Carl's commitment. We'll leave it to Carl to drive something so seemingly impractical on a daily basis. 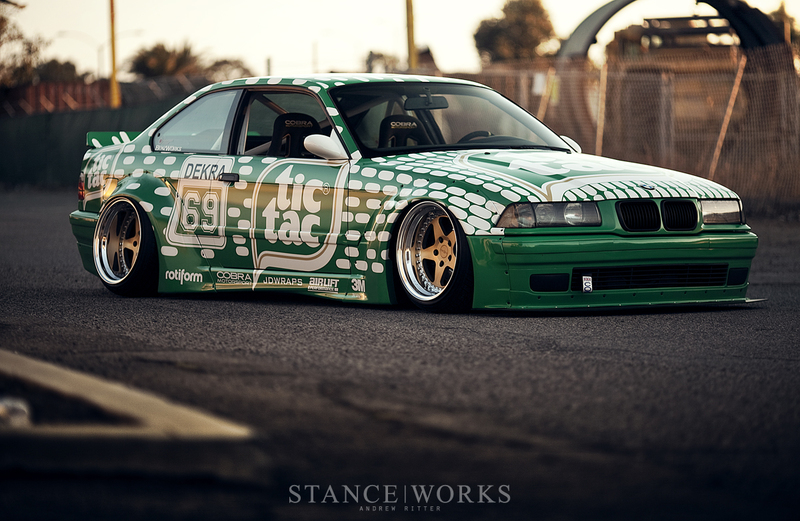 Southern Californians - keep an eye out for the Tic Tac E36. Excuse me! Can I ask you what the camera lens do you use to take these picture?